This scaled-down brick Georgian is a masterpiece of fool-the-eye invention, starting with the bricks. The faux masonry is actually individual pieces of 1/4-inch Lauan plywood, covered with a textured terra-cotta paint. If a cobbler's children have no shoes, then you might expect a doghouse builder's dog to have nothing more than a corner of the workshop floor to call his own. Luckily for Gumpy, that wasn't true. 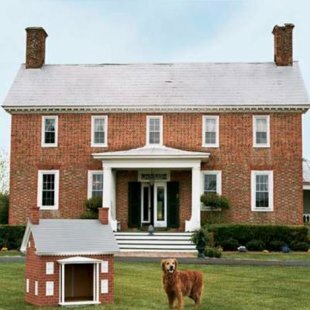 Carpenter Mark Jolliffe, who with his brother, Dale, designed and built the canine constructions featured here, made his 8-year-old Shetland sheepdog companion a storybook Arts and Crafts bungalow. 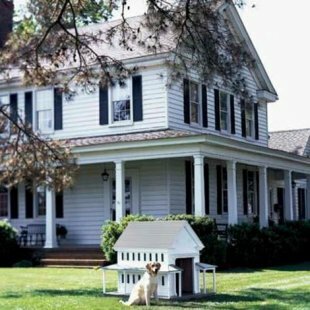 A farmhouse without a dog is like a ...well, we don't even want to contemplate it. And neither does Emma. When the frisky yellow Labrador gets tired of barking at cows, digging holes in the garden, and chasing skunks on the range, she kicks back in a clapboard version of an American icon. Surely, original homesteaders couldn't find a better place to pass a summer afternoon than under the shade of its broad porch, which sweeps around the house like a cool country breeze. 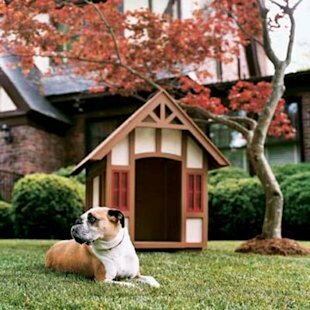 You don't have to be an English bulldog to feel right at home in an English-style Tudor. You don't have to be a bulldog at all, for that matter. 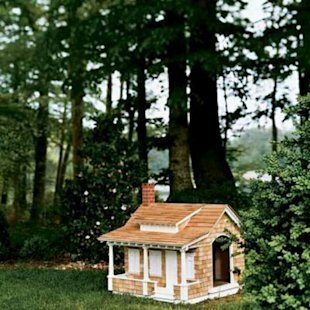 Alfie, an 8-year-old boxer, liked this little cottage just fine. 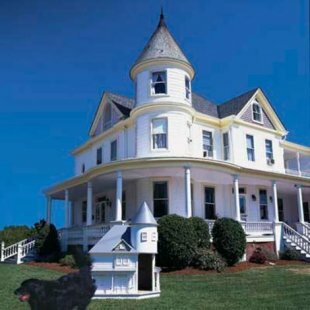 With its steeply pitched faux-slate roof and pale stucco exterior, the 4-foot-tall doghouse is Tudor to a tee. It's even got classic diamond-pane leaded-glass windows-except these are made of plastic gutter guard, cut to length and hand-painted an earthy red. When you're a 90-pound Newfoundland, a simple studio apartment won't do. You need something suitably majestic. Something big and substantial, something with character. What you need is a front-lawn Queen Anne. With its intersecting rooflines, multiple gabled dormers, wraparound porches, and soaring turrets, a Queen Anne is the most over-the-top of Victorian-era styles.